Lancashire justified their tag of County Championship Division Two favourites with a crushing seven-wicket win over Middlesex at Lord’s courtesy of a career-best from spinner Glenn Maxwell. The Australian international (5-40) claimed a first-ever five-wicket haul in a bewitching 16.5 over spell either side of lunch. Maxwell’s efforts, ably assisted by Jimmy Anderson (3-29), meant the hosts were bundled out for 200, leaving the Red Rose county just 39 to win, so recording their first victory at Lord’s since 2006. The day began with Middlesex 94 behind and needing to bat out most of the day to salvage a draw. Dawid Malan passed 50 and Sam Robson top-scored with 63, but despite their efforts a repeat rescue act never looked likely. 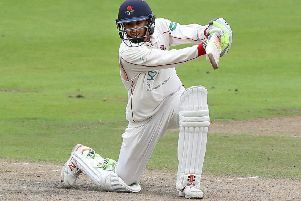 Yet for more than an hour at the start of the day Robson and nightwatchman James Harris resisted bravely, the former raising his first half-century of the campaign with seven fours. Harris, should have been dismissed on 18 when he feathered one down the leg-side in Josh Bohannon’s first over only for the bowler’s celebrations to be cut short by a cry of no-ball. The Welshman wasn’t to cash in on the reprieve, departing just two runs later after an injudicious swing at a wide one from the same bowler. Robson too enjoyed a slice of luck when edging one to the left hand of Maxwell at slip, but just three balls after Harris left the scene he was gone too. Anderson produced a trademark delivery which left the former England opener a fraction off the pitch and he edged it through to wicketkeeper Brooke Guest. Malan and Max Holden got to lunch without further mishap but soon after the resumption Maxwell began his decisive intervention. Malan moved to 50 with a sixth boundary only for Maxwell to end his resistance the very next ball with one that bounced and took the edge. Anderson ripped out Toby Roland-Jones’ middle-stump but it was fitting that Maxwell then took centre-stage once more, bowling Simpson and trapping last man Tim Murtagh leg-before two balls later. Lancashire made heavy weather of the 39 needed for victory. Keaton Jennings wasted the chance to get a not out against his name when top-edging a short one from Murtagh into the hands of deep-square. There was then a third first-class wicket for Robson, who bowled Guest for 11, and Maxwell too departed to the Sydney-born part-timer caught at mid-off before victory was confirmed.